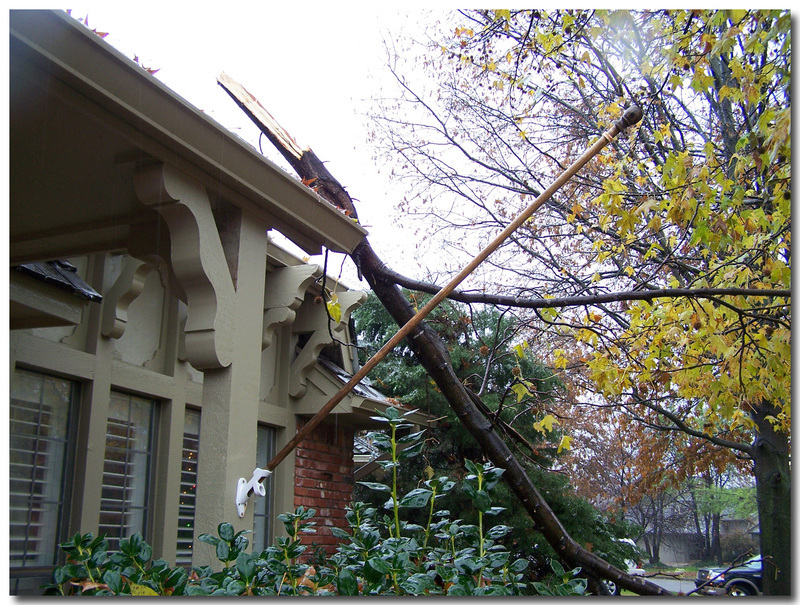 …because broken trees are all we can talk about around here. We just heard a report that this is the worst ice storm in Oklahoma history–one in three Oklahomans are without electricity right now. There are a bunch of cold people huddled in my state tonight–please keep them in your prayers. Remarkably, we continue to have electricity–most everyone we know is without. We drove around for awhile this afternoon and just gaped at all the downed limbs. Entire neighborhoods, including ours, are transformed. Due to power outages, there has been no school so far this week, and they’ve already called it off for tomorrow. My husband said something very poetic about "this must be how God does His pruning." I just elbowed him in the ribs and cried. To those of you out there weathering this same nasty storm, hang in there, count your blessings and eat some cookies. It actually really helps. Oh gosh. We went through the same thing in 1994, without electricity for two weeks. It was the most bored I have ever been in my life. All we could do is clean up limbs for weeks. Glad everyone (and the house) is ok. Tell the kids Mommy Cracked feels really, really sorry for them about the trampoline. Here in Kansas CIty we have had a similar ice storm, though thankfully not as bad as your storm in Oklahoma. 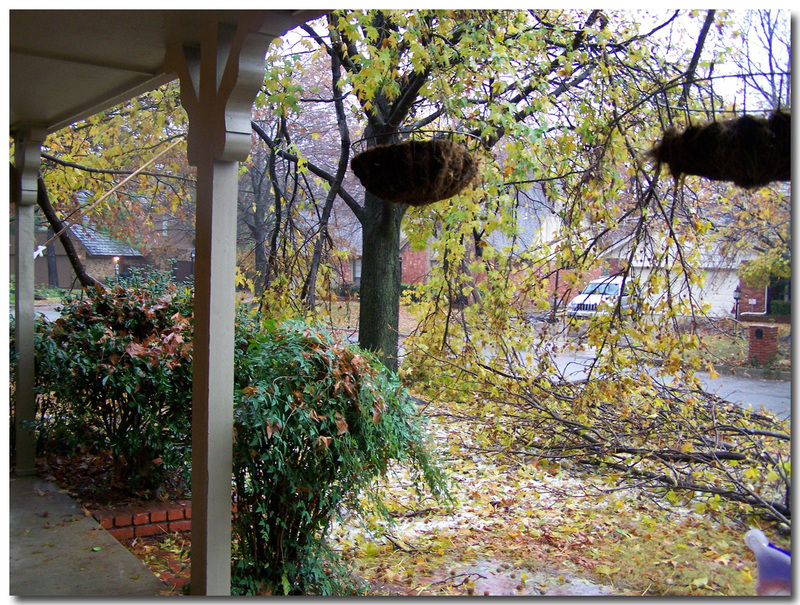 My very favorite tree (a gorgeous willow right off our patio) has been utterly destroyed. On the bright side, we also are safe and warm and grateful for our electricity. Hang in there! I was watching the news this afternoon and they were reporting on Oklahoma. I thought of you and your family. I actually thought, “hmm that looks just like the picture of her neighbors acrossed the street”. But I am sure all of the state looks like that. I am glad that you are all safe and warm. We will keep you in our thoughts out here in Southern California. Oh my. I’m glad you and your family are safe and hope this nasty storm passes soon!! Ice storms are horrific. So glad your trees missed your house. I have thought about you all day today – so glad that y’all are safe and warm. I remember ice storms from growing up in Texas! Nasty stuff. But you just need one slightly warm, sunny day and it disappears (leaving you with all your mess to clean up, of course…). Hang in there! My heart aches for those beautiful trees. Thank goodness you have electricity! Oh wow! You can barely see your neighbors across the street. Privacy fences can be nice, but this is definitely not the way you would want to go about getting one. Hang in there! We are thinking and praying for you and your family! I remember when I was in high school there was a huge ice-storm in TN. Many people were without power, my family included. However, our living room could be closed off and we had a small propane heater. A very close family from church came to our house and we all bunked in the living room for several nights. It was nuts, but at least we were warm. You guys have anyone bunking at your house? If a person has never experienced an ice storm before where the electricity is knocked out, she cannot know the weirdness of it. All of our kerosene heaters and generators were sold out, businesses were dark, you could see your breath in the house, and when you stepped outside, it was completely silent except for branches snapping and falling. (I’m in Indiana–we had a bad one a couple of years ago that I’m still not over.) Praying for you guys. We had a humdinger of an ice storm in Ottawa in 1998. Some poeple were without power for 3 weeks. The military was called out to help eventually. A lot of people who didn’t appreciate the importance of reservists (like your National Guard) in communities were shown how important these men and women are. I hope that your situation doesn’t get to be that bad. The eeriness of the trees cracking and the silence of so many people staying at home is quite something. Take care and good luck. Oh, wow. Praying for you. I’ve been wondering about you all day. Glad to know you are the lucky 1 in 3. I’m wondering if the neighbors are all at your house for warm showers etc. It sounded like it might be a minimum of a week without power. Hang in there! Oh Shannon…I really can’t stand it! You have been on my heart and we are praying for all of you in OK. I almost feel guilty bc in TN it is an obnoxious 72 today. Pruning isn’t fun in any form or fashion and I’m truly sorry. Even for the kids trampoline. Oh gosh, I’m so sorry about the loss of all those beautiful trees! Very relieved though that you still have power. We had a similar ice storm here in ’94, I think and lost a lot that way, and then when Hurricane Elvis blew through in 2003, we were without power for 13 days. Then it was horrible heat instead of chilling cold though. Prayers your house stays protected. It looks the way it does here after a hurricane. How sad. I pray that the elderly will be OK without heat. I always worry about them in times like this. I am sorry you and so many others are going through this. Ice Storms are the absolute worst winter weather. 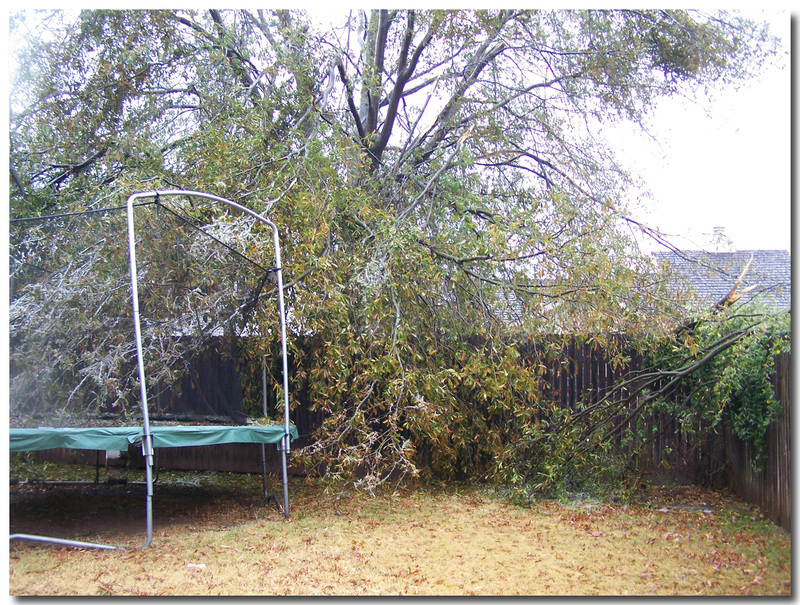 Please give the kids a hug for me, I know they are very sad about their trampoline. Hang in there! And what a blessing you still have electricity. It gives you the opportunity to provide a haven for others (if they can get to you). We’re down here in Lawton, and our ice was melted by 2.5 inches of rain today. Thankfully, our neighborhood never lost power…hope you don’t either! that looks pretty bad. we’re driving through oklahoma tomorrow! should we stay home? that was how parts of florida looked after the hurricanes (well, except for the ice part). it’s no fun being without electricity in any kind of weather extreme. stay warm!! When I heard the news you and your family were immediately in my thoughts. It’s funny how these ol’ Intertubes bring perfect strangers closer to one another even if only in thoughts and prayers. Oh Man, have fun with that clean up. Yikes! Oh Shannon that is so sad. I’m glad no one got hurt over at your place. Praying for you all. I’m sitting here at my desk in CityPlex Towers blow-drying my hair. No power since EARLY Monday morning. And we can’t go stay anywhere because of our dogs. You and all the others are in are prayers! Everytime I see it on tv I think of you! Glad to hear you still have power, warm soup and cookies! Unbelievable. Those photos are unbelievable. 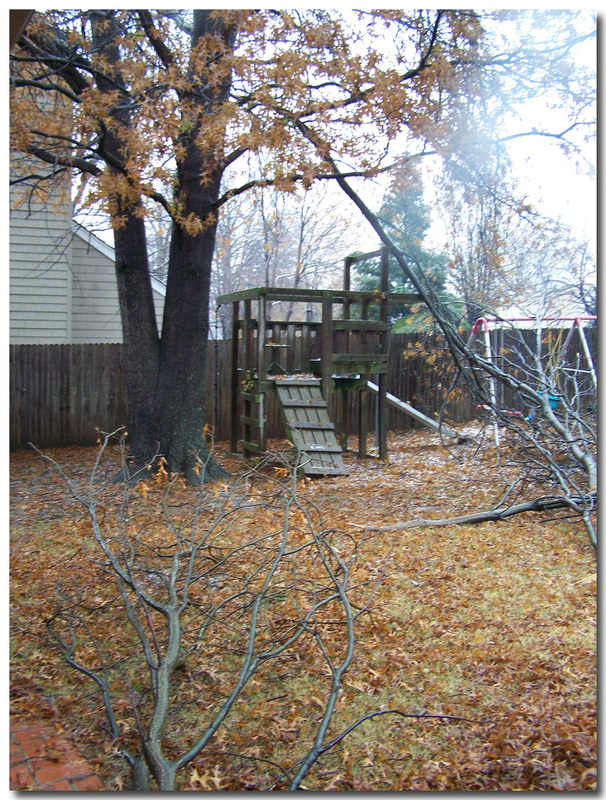 We once lost our power for 4 days due to a macroburst storm in the summer. However, since we live in a rural area, and have a well and septic system, we also lose our water and can’t flush toilets! THAT is NOT FUN. Especially with little kids. We had to pack up and stay with relatives for a few days. Our ILs have since purchased a generator so if someone in the family loses power like that again, we can at least have a few bare essentials. Those pictures are fantastic, but how frightening!! I guess God is really watching out for y’all and your house. Maybe not so much the trampoline 😉 I hope it survives!! We’re in the same weather system here in Kansas City, but we are facing nothing like you are. We are covered in ice! Praise God for warm fireplaces and creative cooking. I’m sorry for how much damage you’ve sustained. Praying for quick recovery and healing in Oklahoma. Wow, that is really heartbreaking. I love trees and the beauty (and shade) they give. I hope there is some recovery next Spring and Summer. We’re in Missouri and are seeing the same affects from this same storm. Most have electricity now, though a few still do not. We’re lucky to have never lost electricity, but our area does have major damage caused by falling limbs/trees. Check out our blog at silverscoop.blogspot.com to see some pictures of our area. While we have it bad, it’s nothing compared to what I’m hearing about OK. Hang in there. Hope everything gets better soon. Here in Missouri, we were without electric for several hours yesterday. Everything is covered in ice and there are limbs down everywhere. We are going through it, too. Had to camp at my parent’s house for awhile, but our power is back on. YEAH! My Coach has already been out with the chainsaw trying to get some of them cleaned up. Now it’s COLD. Brrrr. Thanks for the post. It’s been so crazy here, it’s nice to see that some of life is continuing on as normal. So glad you and your family are okay, but so sorry to see all the damage!!! Will keep you all and the rest of those affected in our prayers! glad to hear you all are ok. we have been fortunate as well it seems somehow the storm split and went north of us and south of us but not much right here on top of us. we havent lost power at all and no trees this year. we lost 37 trees during the big ice storms earlier this year in Jan so i am thankful to not lose any this go round. Bless you and hoping this next storm does NOT hit anywhere near like they are saying. Oh I feel your pain. We’re in the Tulsa area and it’s just horrible. Fortunately we got our power back yesterday, after 2.5 days without. And it’s one of the few times we’re thankful we hadn’t planted any trees in our yard yet. I went through a bad ice storm back home in Indiana in ’91. I thought that one was bad, and it was. But I think this one is worse. Yuck. And now there’s a storm watch for snow Friday and Saturday. Fabulous. Hope your cleanup doesn’t take too long! Sorry again about the trees. We just got power back today in our area. Luckily we have a gas fireplace that kept us warm. And helped roast hot dogs and smores to eat when we wanted “hot” food. Are you ready for the weekend? The grocery store was INSANE when I went out for more bread and milk today. I stocked up earlier this year on non-perishables, so we still have plenty of those to last another storm or two. I have been catching up on Laundry and dishes, just in case!